Boston, Mass. – Citing his recent poor performance as a first base coach, Boston Red Sox GM Mike Hazen said a decision has been made to demote Ruben Amaro Jr. to the position of bat boy for the first month of the season. “We hope Ruben will gain some much needed experience and we’ll evaluate his status with the team after April,” Hazen said. When asked what led to the demotion, Hazen said it was several moments during Spring Training that stood out to the organization, namely Amaro’s habit of defending his decision to not use advanced statistics during his tenure as the Phillies GM. The new Red Sox first base coach is already looking to make a mark in the city. 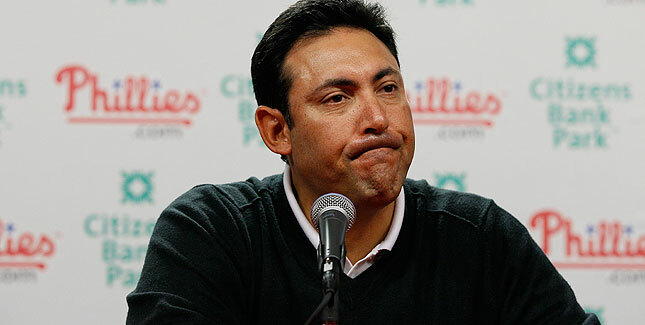 Boston, Mass – Speaking to media during his first spring training with the Boston Red Sox, new first base coach and former Phillies GM Ruben Amaro Jr. expressed excitement at a new start with a new franchise. “I’m grateful for this opportunity to alienate myself and have the good people of Boston absolutely come to hate me in the next several year. It should be a wild ride,” Amaro Jr. said, picking up a foul ball and whipping it towards David Ortiz, whose back was turned to the interview. The Red Sox announced Ortiz would miss the first three months of the season with a concussion. What is up tobogganites? By the time you read this I’ll either be sitting in an outpatient surgery center or drooling on myself in a propofol induced slumber as some quack doctor shoves an endoscope down my esophagus. Now before you fret, know that my doctor told me that his initial diagnosis for me was “Wahhhh your tum tum hurts” so I’m not too worried about what he’s going to find.